Whether you run a corporation, nonprofit organization, small business, or association, a history timeline wall offers many benefits to your organization and its facility. History walls can strengthen your overall branding strategy, reinforce your marketing story, inspire a sense of pride among your staff and supporters, and elevate the interior design of your space. Most of the clients we have worked with to install a history wall have never created a timeline display before, so we wanted to share this story about how we collaborated with a recent client, the Gift of Hope, to design and build their historical legacy wall. The Gift of Hope is a nonprofit organ and tissue donor network serving Illinois and northwest Indiana, and their headquarters is located nearby in Itasca, Illinois. 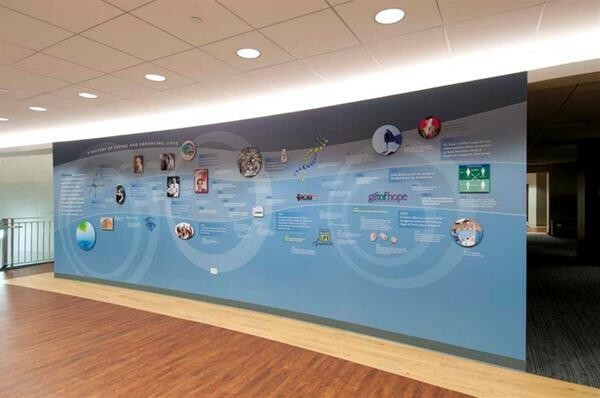 We worked with a group of the organization’s top leaders to create a donor wall covering a wall which was 8 feet tall and 31 feet wide and had a slight radius. Because we had decades of history to incorporate in the timeline display, we began the design process by having the Gift of Hope leaders meet together to discuss the history of the organization and decide which milestones were most significant. In this particular project, the leaders faced a great challenge in selecting which events would be represented on the wall because the Gift of Hope was actually formed through the merging of three original charity organizations. Once we knew how many events, milestones, and other elements would need to be represented in the timeline, we presented several design concepts to the leaders so they could decide which layout and style they preferred. At this stage in the design process, our goal is not to present a client with a finished project, but rather to incorporate the organization’s brand standards into several history wall design concepts the leaders could choose between as we worked to finalize the layout and graphics. In this case, we used the Gift of Hope’s preferred colors, fonts, and nature inspired imagery to generate a few timeline wall design options. Ultimately, the Gift of Hope leaders decided on our design inspired by nature and water elements, which included graphics mimicking the pattern of ripples in a pond. From there, we worked closely with the organization’s leaders to write descriptions of each event they wanted on the timeline, and to collect images and graphics which would accompany this copy. Whenever we build a history wall, we prefer to include dimensional elements which add visual interest and break up the written content. 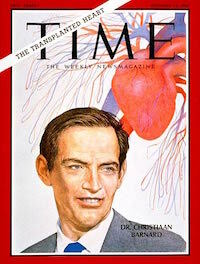 Some of the images we included in the Gift of Hope’s timeline wall showed the back of a driver’s license indicating an organ donor, a TIME Magazine cover which showed the first artificial heart, and portraits of the organization’s founders. In some cases, a client may have trouble finding enough images to include in the history display, so we often help source these images or even design new, custom graphics as a supplement. When the history wall design was completed, we then fabricated the wall by using a printed seamless wall covering which contained most of the text, the background shapes, and some of the images. The rest of the images were installed using dimensional elements on top of the wall covering. When your organization or company is ready to design a history wall to celebrate your legacy, give us a call. We collaborate closely with your team throughout the entire process to facilitate the design process and ensure you are completely satisfied with the end result. For more information, you can see some of the other history walls, history timeline displays, and historical timeline walls we have designed or contact us directly.